Themistoklis Aravossitas teaches Modern Greek language and culture at the Centre for European, Russian and Eurasian Studies of the Munk School of Global Affairs and Public Policy, University of Toronto. 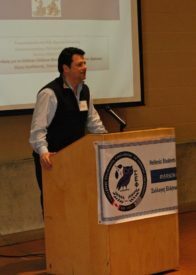 He holds a Bachelor of Education from the University of Athens, Greece, an MA and a PhD from the Department of Curriculum Teaching and Learning of the Ontario Institute for Studies in Education. He is a SSHRC-Canada post doctoral fellow investigating the status of heritage/community languages in Canada. His recent publications include the books Rethinking Heritage Language Education (Cambridge University Press) and Handbook of Research and Practice in Heritage Language Education (Springer).